You can delete the temporary scans, in previous versions were deleted automatically! 1.) ... Delete temporary scans from Version 4.19! 2.) ... Delete the temporary scans before and in version 4.16! See also: Should I use WIA, or TWAIN scanner interface? 1.) Delete temporary scans from Version 4.19! You can again activate the option in WinScan2PDF or "Don't delete temporary scans"
(Image-1) Don't delete temporary scans! (Image-2) Delete temporary scans Query and Yes! 2.) Delete the temporary scans before and in version 4.16! After many users deleted these from accidentally and needed them the next day, they had to scan the documents again. So that it does not happen there is in Win-Scan-2-PDF the function to change the temporary folder and just as fast to open. Here you can decide for yourself what should be deleted. There is no skill required to delete temporary scans, the solution is, or instruction is written not only for Windows 10 and 7, even though the sample screenshots for deleting the temporary scans were taken on Windows 10 and 7, you can use the solution easily to erase Temporary Scans on older versions of Microsoft's Windows operating systems, whether it's a Windows Windows desktop computer, on the go tablet PC, Surface Pro / Go, or even as an admin from a high-performance cow MS server operating system. 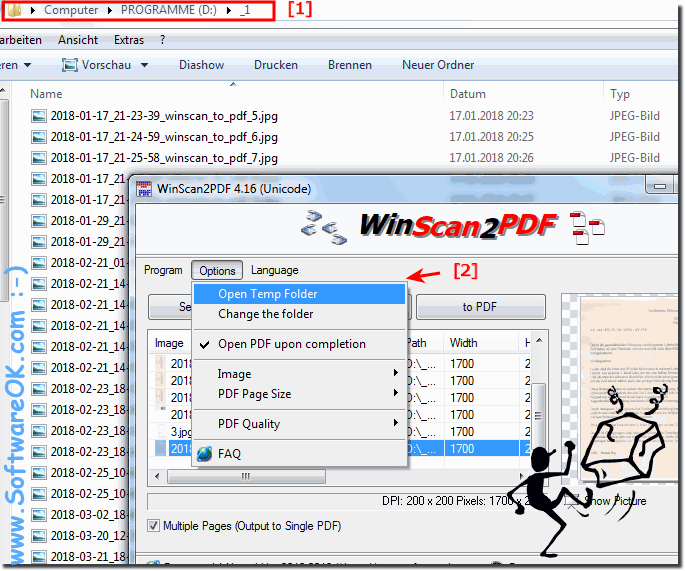 WinScan2PDF - FAQ-17: I can't delete temporary scans, why? In the program WinScan2PDF, however, I miss the described option "Do not delete temporary scans". The menu item is not available in my version 4.16. I also like the parameters that I could write to the .ini file to delete the temporary scans. Is there perhaps a newer version? Have I overlooked something?